Many of us get really frustrated when our online platforms make changes to the user experience. Sometimes we like them, but more often than not, we get really angry and outraged by changes to our favorite social networks. I’m not immune to the anger; I’ve just gotten really good about understanding that I don’t have control over these things and I’m not obligated to use the platforms anyway. But, still, it can be a hassle. I’m also a big fan of the “[insert online tool] in Real Life” meme. This video, shared with me by one of my bosses, demonstrates the disregard many of us feel when new changes occur to these platforms. I give you: A Facebook Update In Real Life. In an effort to become the center of the social hub and violate your privacy (which, incidentally, Facebook doesn’t believe in anyway), Facebook made some interesting changes recently to…well, nearly everything. As a marketer and, more importantly, your friend, I just want to point a few things out that may be of interest to you. Here’s a cool update: I just got a DM on Twitter from @jimmyeatworld “thanks for the nice article! and thanks for listening.” Nice work, guys. I’m hooked. As a fan of both social media and music, I like to report on outstanding social web exercises. One of my favorite bands, Jimmy Eat World, has been forcing me to engage with them online – and I like it. Check out my guest post, Jimmy Eat World Gets Social on The Round Table where I discuss my love affair with the band’s engaging approach to their 10-year anniversary of the Clarity album. 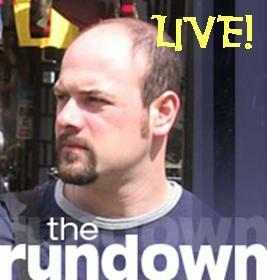 The Rundown is back! Welcome to the newly revamped Rundown Podcast. Once again I’ll be giving and getting The Rundown on social media and all things Public Relations and Digital marketing on the web with a knowledgeable person. Episode 1 (Run time: 31:40) of The Rundown Podcast welcomes Matt Dickman, the Techno//Marketer and his new eBook series “The Face of Facebook: A marketer’s guide to understanding the population of Facebook” Which is a comprehensive guide for marketers to understand what the population of Facebook really looks like and how to market within the community. 08:01 Why the Face of Facebook? 16:49 Male, female or other?